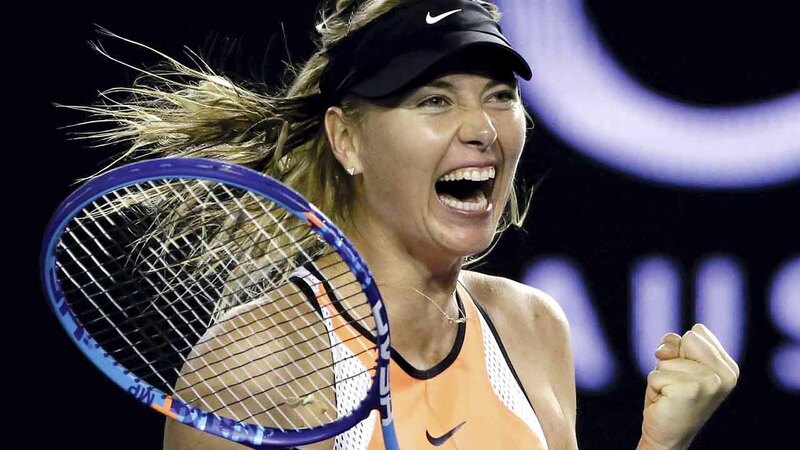 LAUSANNE, Switzerland -- Maria Sharapova will be eligible to return to competitive tennis in April after her two-year doping ban was reduced to 15 months on Tuesday by a sports court that found the Russian star did not bear "significant fault" for her positive drug test. The Court of Arbitration for Sport cut nine months off the suspension imposed on Sharapova, who tested positive for the banned heart medication meldonium at the Australian Open in January. Sharapova, a five-time Grand Slam champion and former No. 1-ranked player, appealed to CAS in June seeking to overturn or reduce the two-year penalty imposed by the International Tennis Federation. In a 28-page ruling , the CAS panel found that Sharapova bore "some degree of fault" but "less than significant fault" in the case that has sidelined one of the world's most prominent and wealthy female athletes. "The panel has determined, under the totality of the circumstances, that a sanction of 15 months is appropriate here given her degree of fault," the three-man arbitration body ruled. While Sharapova did commit a doping violation, "under no circumstances ... can the player be considered to be an 'intentional doper,'" the panel said. Sharapova's ban, which took effect on Jan. 26, was originally due to run until Jan. 25, 2018. Now she can return on April 26, 2017, a month ahead of the French Open, a Grand Slam tournament she has won twice. "I've gone from one of the toughest days of my career last March when I learned about my suspension to now, one of my happiest days, as I found out I can return to tennis in April," Sharapova said in a statement. "In so many ways, I feel like something I love was taken away from me and it will feel really good to have it back," she added. "Tennis is my passion and I have missed it. I am counting the days until I can return to the court." The doping suspension kept the 29-year-old Sharapova out of this year's French Open, Wimbledon and U.S. Open, as well as the Olympics in Rio de Janeiro. She will also miss the 2017 Australian Open in January. Steve Simon, CEO of the WTA tour, welcomed Tuesday's ruling. "We are pleased that the process is now at completion and can look forward to seeing Maria back on court in 2017," he said. Sharapova acknowledged taking meldonium before each match at last year's Australian Open, where she lost in the quarterfinals to Serena Williams. But Sharapova said she was not aware that meldonium, also known as mildronate, had been included on the World Anti-Doping Agency's list of banned substances from Jan. 1, 2016. The ITF said she also tested positive for meldonium in an out-of-competition control in Moscow on Feb. 2. Sharapova's lawyer, John Haggerty, called Tuesday's ruling a "stunning repudiation" of the ITF, which he said failed to properly notify players of the meldonium ban. "The panel has determined it does not agree with many of the conclusions of the ITF," Haggerty said in a conference call. "As we demonstrated before CAS, not only did the tennis anti-doping authorities fail to properly warn Maria, if you compare what the ITF did with how other federations warned athletes of the rule change, it's a night and day difference." Sharapova said she was first prescribed the Latvian-made drug, typically used for heart conditions, by her family doctor for various medical issues in 2006. She said she took the drug for regular bouts of the flu, possible onset of diabetes and a magnesium deficiency. An independent ITF panel had found that Sharapova did not intend to cheat but bore "sole responsibility" and "very significant fault" for the positive test. The ITF panel also said the case "inevitably led to the conclusion" that she took the substance "for the purpose of enhancing her performance." More than 100 athletes, including many Russians and other eastern Europeans, tested positive for meldonium early in the year. Some escaped with no sanctions because they argued successfully that they stopped taking the drug before Jan. 1 and that traces had lingered in their system. Sharapova, however, acknowledged that she used meldonium after Jan. 1. A hearing on Sharapova's appeal was held in New York on Sept. 7-8. The player and her legal team argued that she bore no significant fault or negligence and her ban should be reduced to "time served," or about eight months. "I have learned from this, and I hope the ITF has as well," Sharapova said. "I have taken responsibility from the very beginning for not knowing that the over-the-counter supplement I had been taking for the last 10 years was no longer allowed."